Energy Resources of Australia (ERA.ASX) cut its full-year uranium oxide output target by up to 800 tonnes after third-quarter output dropped 35 percent and said it will need to buy material to meet sales obligations. The news, which sent ERA shares down more than 6 percent, is expected to exacerbate an already-tight world market for uranium oxide, used in nuclear power generation. "The shortfall represents about 1 percent of world supply in 2010, so it's not the end of the world, but could have some impact on the uranium price," Warwick Grigor, a sector analyst and chairman of BGF Equities in Sydney. "Overall, ERA is coming in 20 percent under their capacity, and that's significant," Grigor said. ERA, which in 2009 accounted for nearly 10 percent of world uranium oxide output, downgraded its full-year output target to 3,900 tonnes, from between 4,300 and 4,700 tonnes. It also said it would have to go to the market to meet 2010 sales commitments of around 5,000 tonnes. By 0455 GMT shares in ERA, which is 68 percent owned by Rio Tinto , were down 6.4 percent at A$13.53. The limited growth in mined supply is a legacy of the 1990s, when plunging prices froze most exploration and development. 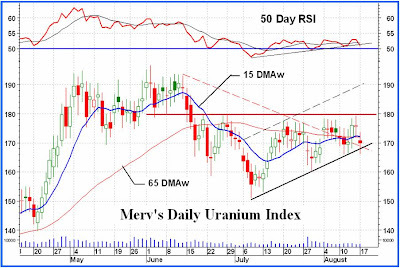 After falling as far as $7 a pound on spot markets in 2000, prices rebounded to $136 in 2007 -- spot uranium UX-U3O8-SPT is now at $48 -- as countries searching for an alternative to greenhouse gas-producing power sources such as coal have re-embraced nuclear power. The Australian Bureau of Agricultural and Resource Economics forecasts global uranium production in 2010 will rise 5 percent to 60,190 tonnes, mainly because of higher output from Kazakhstan and parts of Africa. ERA said its outside purchases were expected "to adversely impact 2010 earnings as the small price margin associated with the sale of the purchased material is more than offset by the ongoing costs of operation."